Late Stage Clovis Preform, McKinnis Cache. This is the largest biface in the McKinnis cache and the best representation of a recognizable Clovis shaped artifact in the cache. The lanceolate shape and "classic" Clovis flaking pattern suggests that this is a late stage preform for a Clovis point. It was made with edge-to-edge percussion flaking. Several large percussion flakes extend nearly across one edge to the opposite edge. A large thinning flake was also struck from the base. This late stage preform was made of Burlington chert and it measures 5 5/8 inches (14.3 cm) long, 2 1/8 inches (5.3 cm) wide and 9/16 inch (1.4 cm) thick. In 1996 a cache of 11 bifaces and 12 core blades (see McKinnis cache) were discovered on land that was being leveled for houses. The site is located on a hill top and within 2 miles of the Missouri River in St. Louis County, Missouri. This cache was made with stone tool manufacturing technology that relates to the Clovis culture. 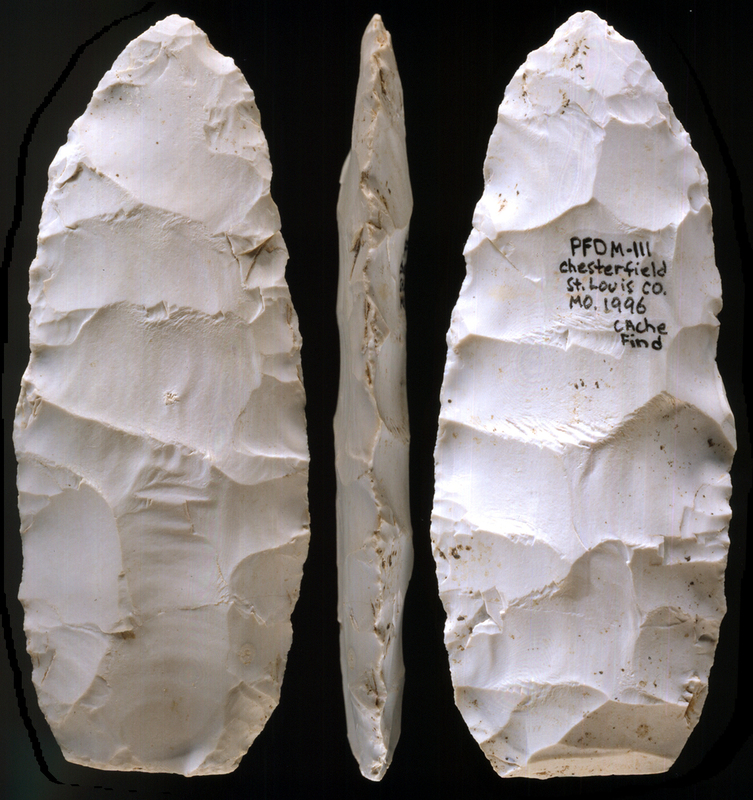 The largest artifact in the cache is a basally thinned late stage Clovis point preform. A base of a Clovis point was also found near this cache.